Rich is a leading premium brand of tasty 100% high quality juices and nectars. In Russia, where it is sold, people love it for its great choice of different mixes, great taste and for the iconic stylish pack which all provide a special experience of indulgence and mental relaxation. 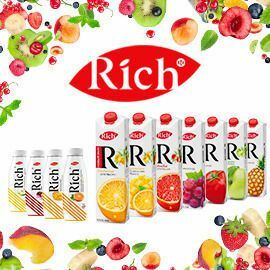 Rich appeared in 2002 and disrupted the juice market with its outstanding design with white-colored pack, big logo and big fruit image on a pack. Since then a lot of mass market brands have been trying to copy its style using the white pack and big fruits. Since 2002 only minor changes have been made in the Rich pack graphic design. It is now time to give Rich packs a fresh look and unique premium visual identity. Can you help Rich juices to stand out on the shelves again? Join before April 28th, 23:59 UTC. Design new tableware for toddlers that will enhance their appetite and encourage them to eat by themselves! Bring to life the launch of a new cognitive/ brain performance product for Berocca!